The fresh ginger in the dressing ads a nice kick. 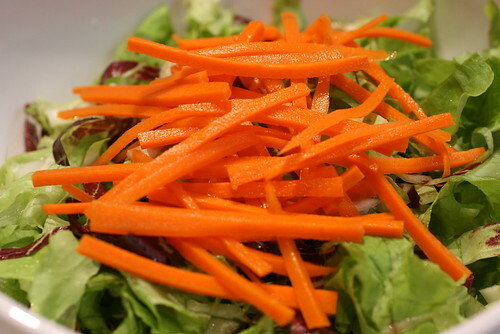 It’s a great salad as a side or a main dish. I had it for lunch yesterday. posted by jessica	at 08:13 AM	Filed under Fusion, Recipes. You can follow any responses to this entry through the RSS 2.0 feed. Both comments and pings are currently closed. This dressing looks really good. I can’t wait to try it. Manger la ville, let me know what you think. tahini sounds familiar… it’s a sauce that’s often used in middle eastern food right?? i like watching horror films .. and the IT written by stephen king is my all time favourite. Renaye, tahini is sesame paste and it used in Middle Eastern foods. 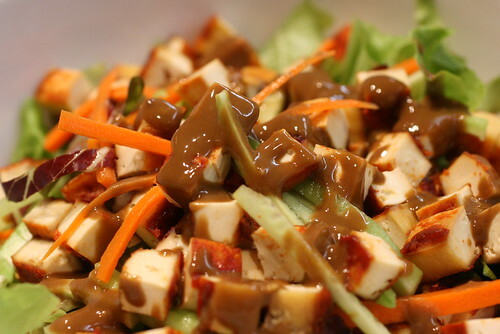 That sesame dressing looks so delicious!! Thank you for an alternate to the ‘balsamic, oil, lemon’ dressing rut that I’ve been in. So easy to branch out. Looks delicious! Eat it Brooklyn, I hear you, I’m often doing the balsamic/olive oil thing myself.